Bob's Burgers is a hilarious cartoon on FOX Sunday nights that has recently become one of my favorite things. The show was created by Loren Bouchard, one of the creators of the great cult show Home Movies and a writer on standup-disguised-as-series-of-animated-therapy-sessions Dr. Katz, Professional Therapist. The cast includes alt-comedy heroes H. Jon Benjamin, Andy Kindler, Eugene Mirman, and Kristen Schaal. It is sweet without being sentimental, vulgar without being obnoxious, dark without ever coming off as trying to be "edgy." We caught up with Lizzie and Wendy Molyneux, sisters who write on the show as a team, and they talked about their favorite jokes and their writing process, but mostly about how much they love each other. Could you walk me through how you got to where you are now? Previous writing jobs, previous non-writing jobs, and what it felt like to get hired to work on a new FOX cartoon? Lizzie: I actually started working with Wendy while I was still in college. She was already a real adult with real writing jobs, but I was just a student interning in the entertainment industry over the summer in LA. I pitched an idea that the producer I worked with liked, so I asked Wendy for advice on what I should do about it. She told me to write it myself. I hadn’t really thought of the idea of being a writer before that moment, but it seemed like I’d be great at it because I thought of one idea that one person liked. Suddenly, being in the real world didn’t seem that difficult and I wondered what everyone was always complaining about. We worked on that idea together and so our partnership just kind of happened. I really thought we’d just sell that first script and I’d be a writer no problem, so I was pretty dumb back then. But hey, it was fun! Wendy: Yeah, that first one didn’t really work out, which is pretty standard. I think that script is buried in a backyard somewhere, and some future civilization will probably dig it up and be like – huh, act two is underdeveloped and there’s no real B story. Future civilizations will be AMAZING at giving script notes. I’d been out in the world working, first as a terrible waitress, then as a terrible temp, then as a terrible group salesperson in the basement of the Pantages Theater, where I started trying to write. When Lizzie and I started working together, I was staffed on the short-lived Megan Mullally talk show. It bit the dust, but I got to know Megan and her husband Nick Offerman while working on that, which was great, and they’ve both been on Bob’s. After that, Lizzie and I enjoyed a prolonged period of being unemployed and eating snacks at my house, then we got an interview for Bob’s and by some miracle got staffed. We loved the pilot presentation so much and were so sure we didn’t get the job that, when our manager called us about it, we didn’t understand what he was saying. We thought he was playing a joke on us. Maybe he still is, five years later. It’s the long con. Were you two, on some level, comedy partners before you began writing, when you were kids? What were you like when you were younger? Lizzie: Growing up, I think we had a very close bond. I was younger than Wendy, so hanging out with her always meant getting to do cool older kid stuff, which I enjoyed a lot. We both really liked movies and joking around, so we were always really good friends. I think I always wanted to try to be funny like she was; I’m kind of still trying to do that. Wendy: And I’m trying to be funny like Lizzie. This sounds like the promising start of a body switching movie. Two sisters, switchin’ bodies – Twisters. In theaters this fall! My sister and I are very close and will often make silly jokes, and people assume they are sibling in-jokes, but they're not, they just happen to be funnier to us than to anyone else. Are you two like that? Do you appreciate each others' senses of humor more than other people? Lizzie: We definitely have some weird ongoing bits in our family, like a bear who kills people on their birthdays, and then some things that we no longer even know the origin of. Like for some reason, we will say to each other: “What are spice?” And it makes us laugh, but I don’t really know how it started or why it’s funny, because it’s not funny. But I do think Wendy is pretty much the funniest person I know, so if I can make her laugh, I know I’m doing ok. And I want her to laugh at my jokes because I’m selfish and needy! Wendy: And I’m cold and aloof. We make it work. Really, I do happen to think Lizzie is the best. This interview is just going to be me and Lizzie complimenting each other for five pages. Sorry. SHE IS MY SISTER AND I LOVE HER. How does working together work for you? Lizzie mentioned a shared office, what's that like? Lizzie: We share an office, which is great. Both of us bring our dogs to work so they are also around and it smells great and not like gross dogs at all. We also share a lunch, which was pretty tricky until our mom figured out how to pack things that we wouldn’t fight over. When we actually do work, we tend to each do our part and then send it along to the other to revise and continue. It’s a good system. I think we have both gotten over being precious about certain ideas or jokes so we can get things done fairly quickly and with almost no arguing! Wendy: Unless it’s over a man. I’ll drag Lizzie around by the hair if she tries to take what’s mine. Describe the process of writing an episode of Bob's Burgers. Lizzie: Writing an episode of Bob’s involves working with a lot of people. When we break a story, we use a lot of the other writers to help, which is really helpful and also involves a lot of people throwing things at each other (paper, pillows, various sports balls that are around the office). As the writer of the episode, you get to do the first pass, but after that there is a lot of rewriting by everyone on staff. Jokes are punched, scenes are tweaked and it’s always better once more people have gotten their hands on it. We work with such a great staff, so it’s a really fun experience. I don’t find much of it that difficult. We are very lucky to work on a show like Bob’s. What's your favorite joke you've ever written for the show? Off the show? Lizzie: I wrote a song about the restaurant/bar that’s across the street from our offices. I’m pretty proud of that. I don’t think I can share the lyrics because they could maybe sue me, but it centers around wearing slacks, eating snacks, shutting traps, and smoking crack. I’ll leave it at that. Wendy: I won’t say this is the funniest joke I ever wrote, but the joke I like the most that I wrote is in Mike Benner’s episode "Linda-pendent Woman" when Linda takes a job at a grocery store and Gene says he gets to keep Linda’s apron because “it still smells like her and I like it because I’m eleven and I still like mom!” It’s sort of a sad joke about kids growing up. I love sad jokes because I’m super sentimental and nostalgic, and I like to joke about it because it makes the unbearable passage of time more bearable. My kid inherited this wistful streak from me, I think. The other day, he turned to me and said sadly, “Mom, some doggies never even get to see Las Vegas.” He’s three. And he’s not wrong. 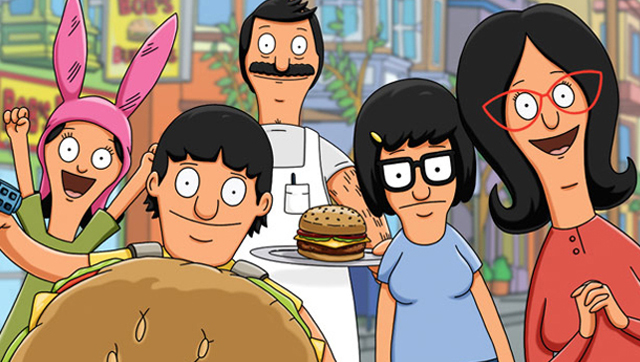 Bob's Burgers airs Sunday nights on Fox at 8:30pm. Wendy's book, Everything is Wrong with You: The Modern Woman's Guide to Finding Self-Confidence through Self-Loathing is out now!